You know a product has reached cult status when you visit a hairdresser and instead of raking a comb through your newly washed hair she presents a Tangle Teezer. First of all yay as I hate the pain (in the literal sense) of combing and as a musing why is it when I was my hair at home thoroughly it doesn't become so knotted yet when a hairdresser does it there are more tangles than hair? Answers on a postcard please. 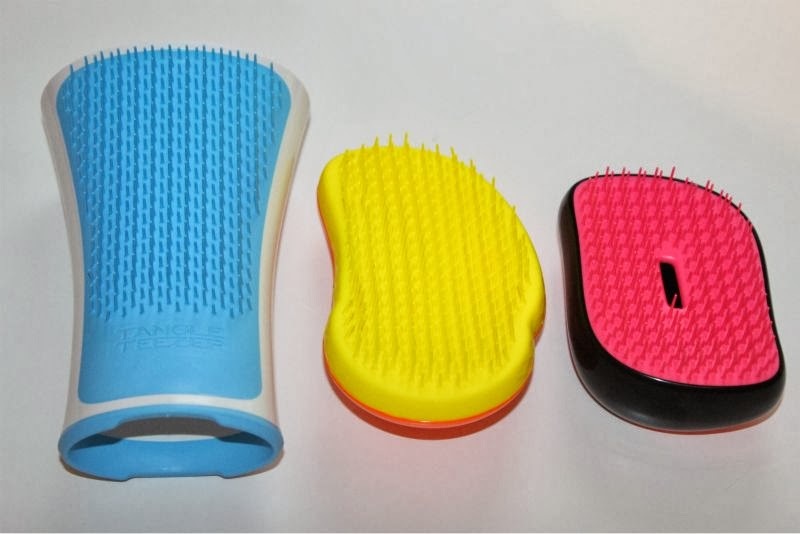 If you have yet to try out a Tangle Teezer of any sorts let me explain how they work, basically they are a moulded plastic brush like device which grips the hair and eases out tangles and knots quickly and pain free. It may look slightly daunting but the entire range has been designed to detangle and smooth the hair's cuticle which helps prevent the hair from becoming damaged. You can use a tangle teezer on wet or dry hair and of course to style as long as you don't apply heat on the device - it is made of plastic and will melt. Speaking of wet hair there is a specific Tangle Teezer designed just for wet hair - Tangle Teezer Aqua Splash Detangling Hair Brush. Unlike the original Tangle Teazer this has a hollow back so water does not get trapped and become stale over time. The design also differs from the original in that it is non-slip so that you can comb out those pesky knots in the shower or at the beach. Every shower, gym bag and beach bag for that matter deserves one and that is no overstatement. While we are on the top of handbags you can also purchase a compact Tangle Teezer which annoyingly is a little more pricey than the full size brush - no idea at all why that is. The main difference size aside is that the compact version comes with a clip on cover to protect it while on your travel. I actually prefer the size of the smaller Tangle Teezer as my stubbly little hands find it easier to grip. Basically whatever your needs there is a Tangle Teezer for you. You can find the entire range of Tangle Teezers over on ASOS with prices ranging from £10-£12.24 - link.